Quick Review: An empty mind is a safe mind. Detailed Review: When I first stumbled across this book on Goodreads and my partner mentioned that the cover for Sekret was really good, I thought to myself, this needs to be on my TBR list. I'm a sucker for historical fiction. Anything that involves past incidents that have actually happened. So when I saw Sekret available for request on NetGalley, I absolutely had no hesitation on clicking the Request button. I kept my fingers crossed on being approved. I got approved. I read it. I rated it. And now I'm writing this review on how much this book really fazed and awed me. Sekret is a great example of how history can really make an original setting for your book. I was very intrigued when I found out that the book was set in the USSR (now Russia) while it was engaged in the Cold War with America. Using a historical setting will give an atmosphere hardly associated with books that have present or future settings. The atmosphere in Sekret was one of tension and secrecy. Giving psychic abilities to the characters gives the book another finishing touch. I especially loved the different abilities which the psychics have, everything from mind-reading to remote viewing and altering memories. The author has got a good imagination. What gives it a high polish are the characters. Yulia is a brave and smart heroine that challenges all-time favourites like Katniss. She did remind me of Katniss at times, possibly because they were somehow under the same circumstances. Yulia's love interest, Valentin was a very hard code to crack most of the time, yet I still loved him. Rostov made a great antagonist as well as Misha and Masha. The secret ingredient though, was still the twists. The thing is, there's no warning of a twist coming your way. It just leaps out at you and stares you down. It's like being drowned and then pulled onto shore and then being drowned again. This cycle will keep on repeating as you read the book. And then when you find out there's a sequel... I was like, where's the cliffhanger?!? Unlike other books, the ending was surprisingly well-rounded. Nonetheless, I still need the second book!!! Finally, a request. MAKE ME A PSYCHIC!!! 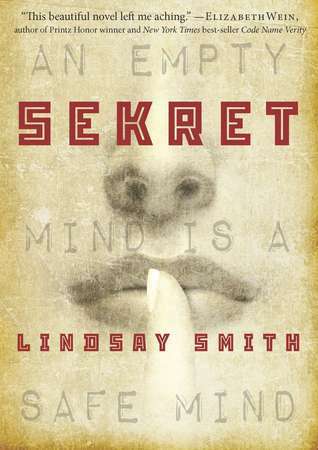 Brief Review: Lindsay has obviously done her research regarding Russia in the 1960s and captures the atmosphere well with her descriptive prose and secretive air in writing. She artfully brings her characters to life with words and their psychic abilities is the result of creativity and thorough research. This debut clearly wears out a path for the author to easily navigate and make her voice heard in the writing industry!